Ihering, H.v. 1901. The Unionidae of North America [continued]. Nautilus 15(5): 50-53. Simpson, 1900, Proc. U.S. Nat. Mus. : 571, footnote 4 [as ‘Unio explicatus’]. Type(s): TYPE SMF_3477, Río Chixoy, Nebemfld. Río Usumacinta, Guatemala. Lampsilis occidens (Lea, 1829). — Ihering (1901: 50). Lampsilis pictus (Lea, 1834). — Ihering (1901: 50). Lampsilis sapperi (von Ihering, 1901). — Ihering (1901: 50). Nephronaias averyi (Lea, 1859). — Ihering (1901: 51). Nephronaias calamitarum (Morelet, 1849). — Ihering (1901: 51). 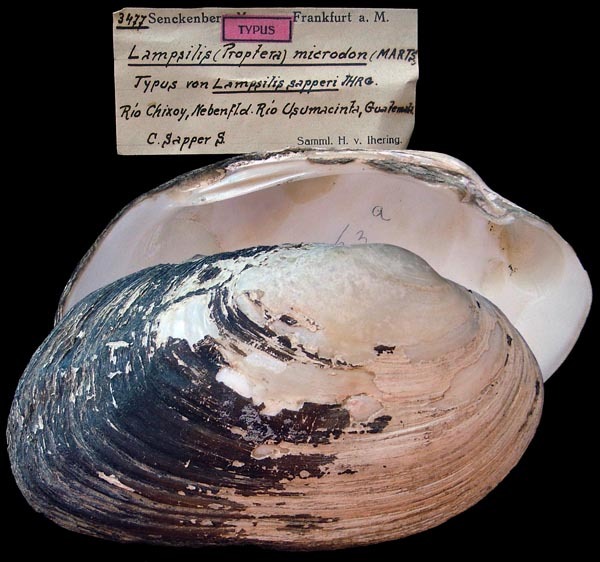 Nephronaias medellinus (Lea, 1838). — Ihering (1901: 51). Nephronaias scamnatus (Morelet, 1849). — Ihering (1901: 51). Nephronaias spheniopsis (Morelet, 1849). — Ihering (1901: 50). Nephronaias tabascoensis (Küster, 1856). — Ihering (1901: 51). Quadrula pernodosa (Lea, 1845). — Ihering (1901: 50).